Now you might think this is a strange place for me to write about refinishing my dining room chairs, but why not? 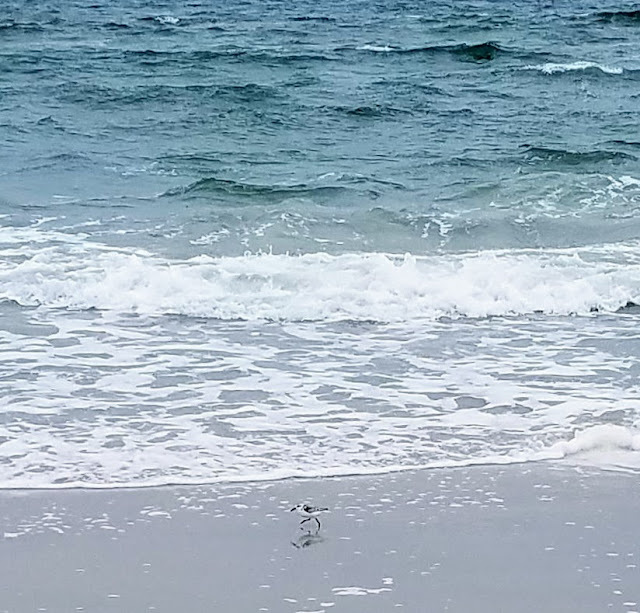 I am writing about what I do. 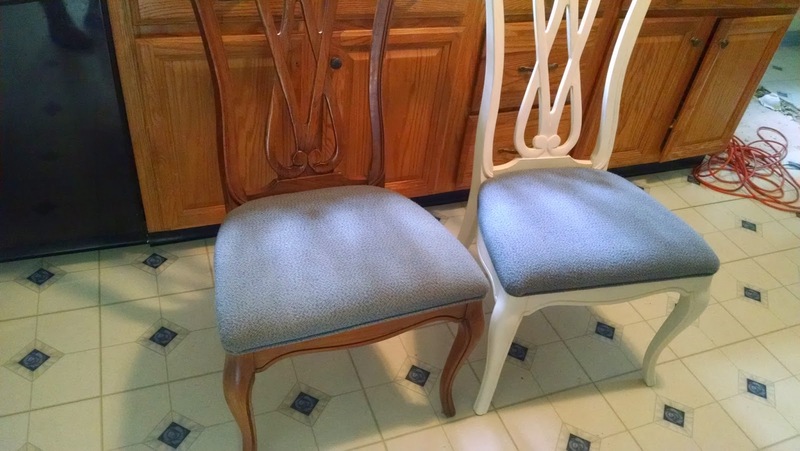 I took a bunch of pictures and now someone else who wants to update their old dark furniture can have directions. About twenty years ago, Eric and I bought a gorgeous dining room set of solid wood furniture made by the White Furniture Company out of North Carolina. Our youngest of four children was just going on two and we needed something for our growing family. A older neighbor posted in the newspaper that his children had bought him a new set of furniture and he was looking for a home for their old furniture. We were thrilled to get the massive set for somewhere around $300 (my husband and I can't quite agree on that figure) and set about moving it into our then French Colonial style home with a separate formal dining room. The years went by, our children grew up, we moved several times and that heavy furniture stayed with us. Fast forward and now those children are coming back home with their significant others and all of a sudden we need a big seating area for Thanksgiving and Christmas dinners. At first, we toyed with the idea of selling the set and purchasing new modern stuff but realized two things; no one wanted the old set and the new furniture that we could afford was not near the quality of what we had. So I took on the challenge of putting a new finish on the old wood, almost against my better judgment (just because I love wood surfaces). 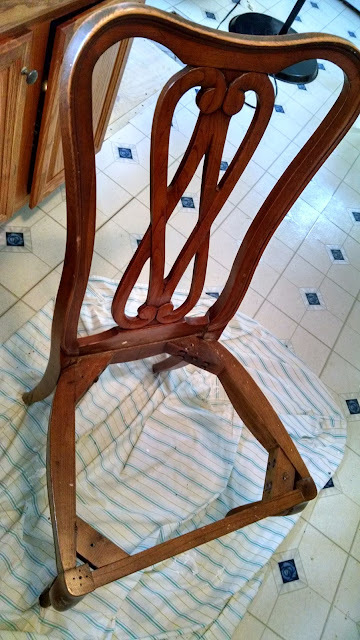 I pulled the first chair into the kitchen and flipped it over to remove the screws holding the seat in place. Then I removed the old flathead screws that held the seat cushion in place. 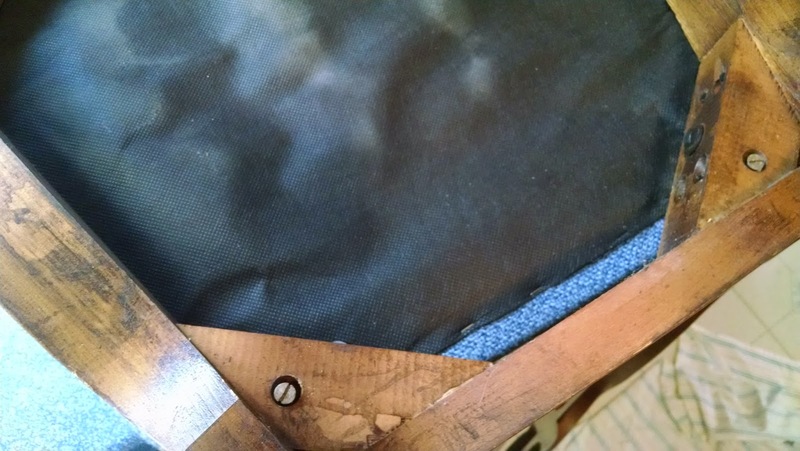 The seat came off easily, revealing twenty years of crumbs and dirt sandwiched between the frame and the seat. Now I knew I had to clean off some of the grime left from little fingers, especially along the top rail. 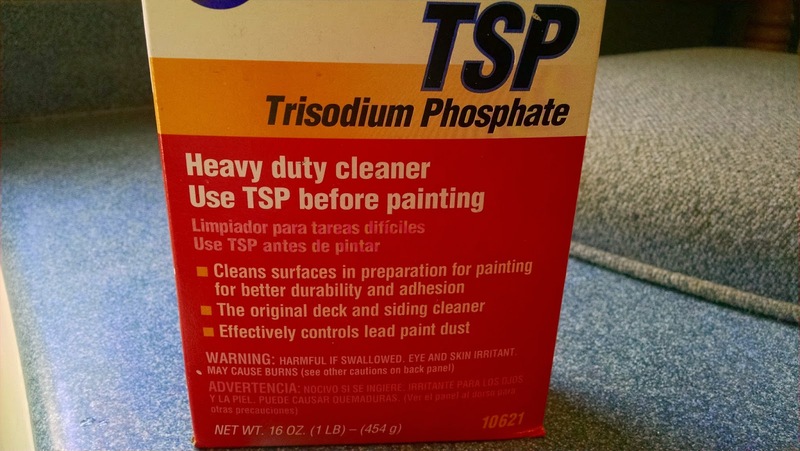 According to my research, before you redo cabinets, the professionals recommend you clean them with a solution of TSP to clean off the grime. 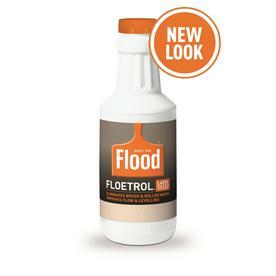 I figured it was basically the same application and bought some inexpensively at my local Lowes. I made a solution according to their directions, put on some rubber gloves to save my skin cells and scrubbed away with a cotton rag. The dirt came off rather easily once I wiped the chair down with the solution and then went back over it a little more vigorously. 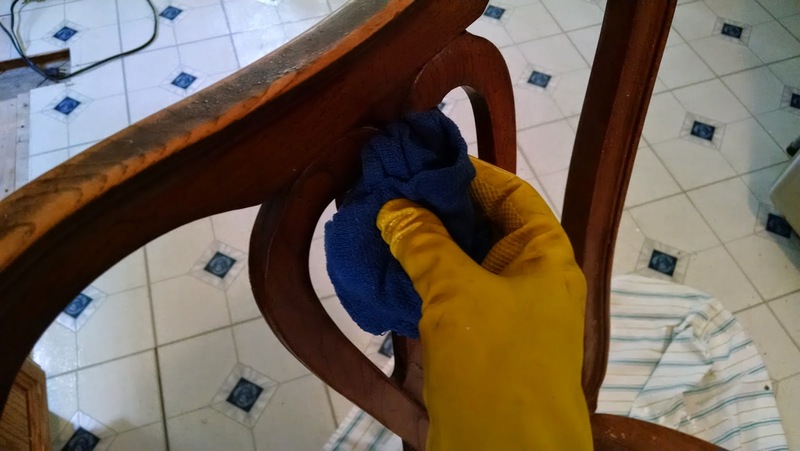 I rinsed the surface of the chair with a clean rag and clean water. 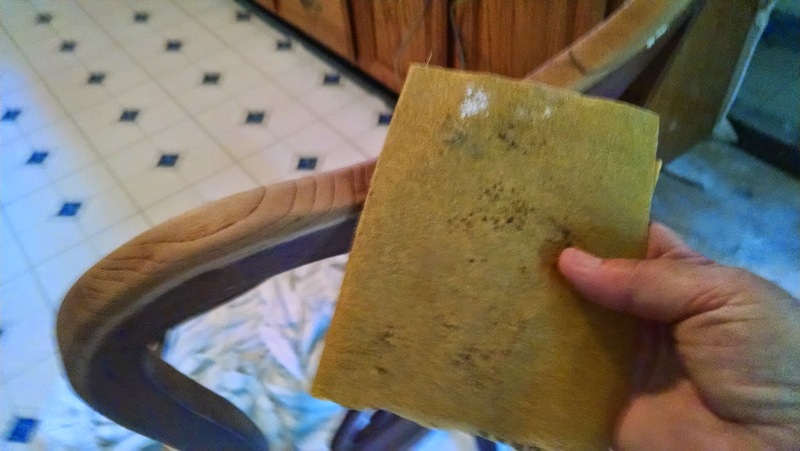 After letting the chair dry out again, I went over all the surfaces with 150 grit sandpaper to get the wood ready for the paint and to remove any leftover bits of dried crud. Now I was ready for painting. I chose a flat latex white paint and mixed equal parts of Plaster of Paris and water into it along with a leveling agent called Floetrol. 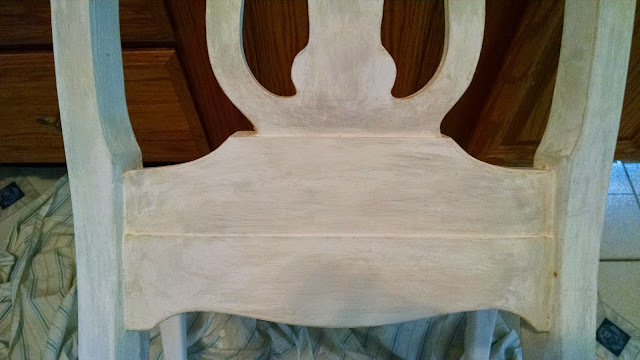 You can find the recipe for the chalk paint from Lowes online here. I was looking for an almost antique look but not distressed. 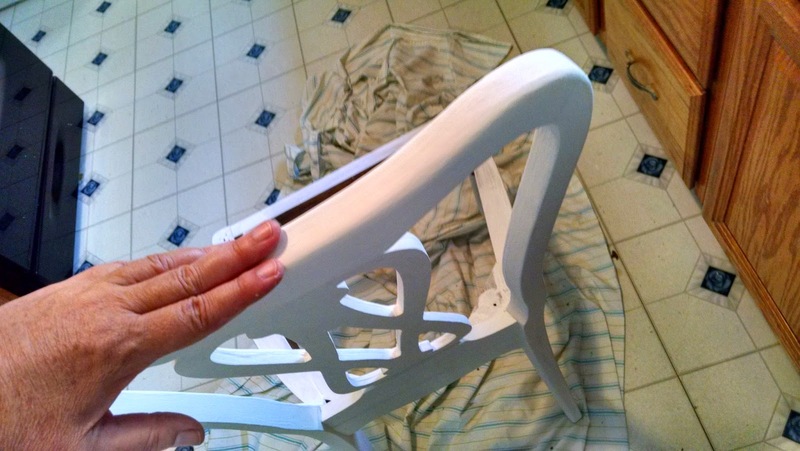 After I applied the first coat, I was a little skeptical since the chair didn't look very good. I did more research and found that many sites mentioned using several thin coats to get a uniform finish. In case you were wondering why I didn't save myself a lot of work and use a sprayer, it's because the addition of the Plaster of Paris would have clogged the sprayer. The first coat took about an hour to dry and I gave it a light sanding with my block sander. I used my fingers to look for rough spots and smoothed them out. 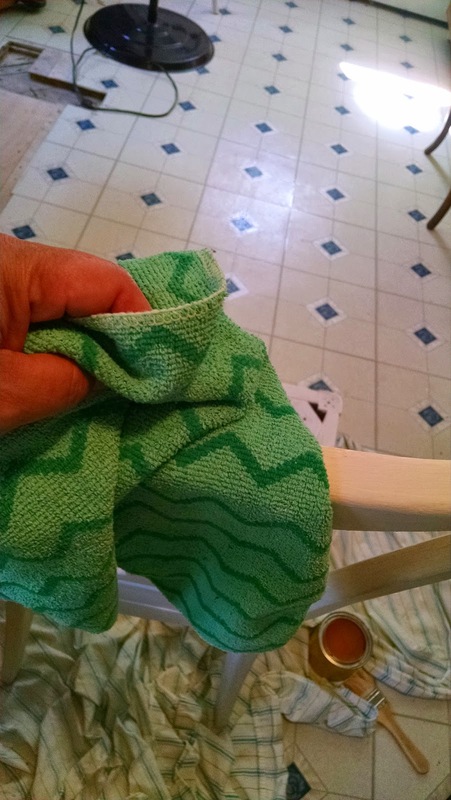 A microfiber cloth worked well to remove the dust. I tried to just enjoy the project and took my time to paint, wait for the full drying time, sand lightly, wipe down, repaint and repeat. 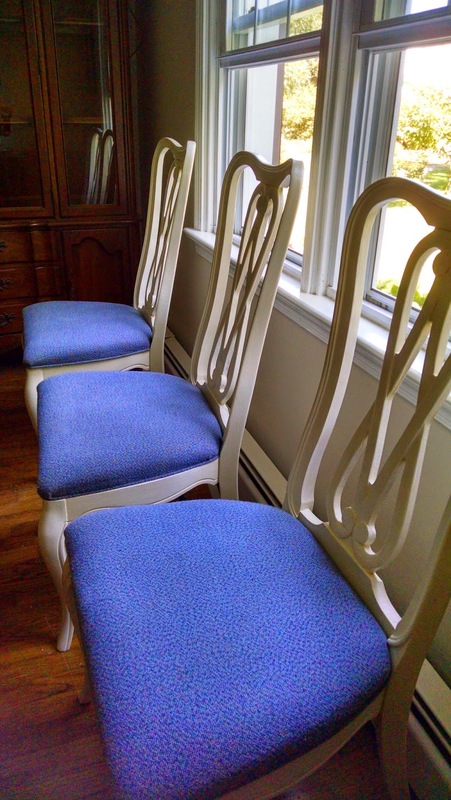 Each chair needed four coats of paint. The first chair was my test and so it took me a couple of days. 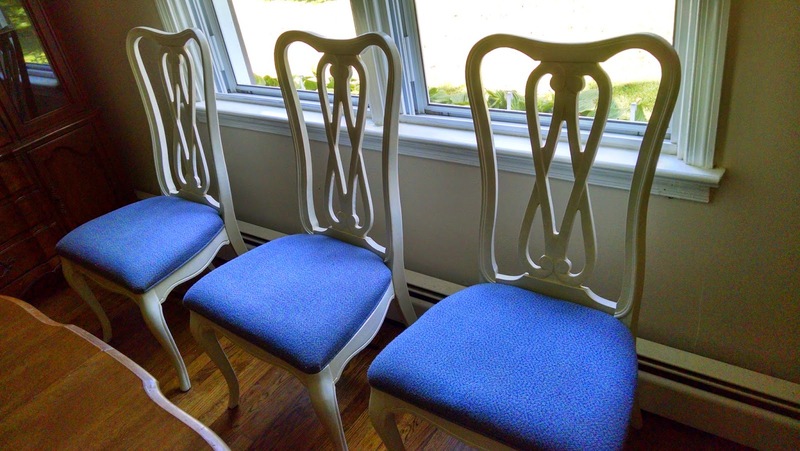 Once I understood the process, I worked on two chairs at a time so that by the end of the week, all six chairs were finished. Once the painting was finished, the chairs had a very flat, chalky finish and I made sure that we didn't touch them with dirty fingers. I applied a very thin coat of paste wax with a brush. 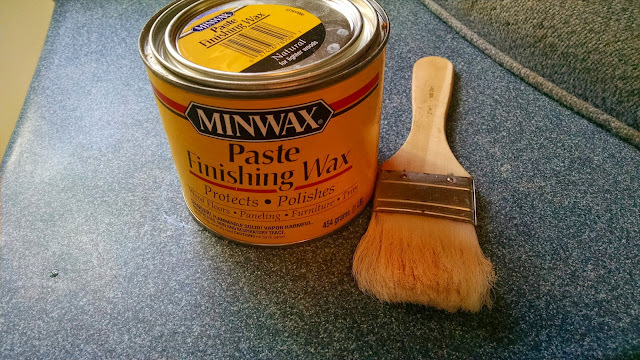 There is a nice round brush you can get for applying paste wax, but I just used a clean old brush I had that I didn't mind sacrificing to only waxing. I followed the directions for waxing, letting it dry for at least 30 minutes before buffing out. A second coat finished off the surface beautifully. 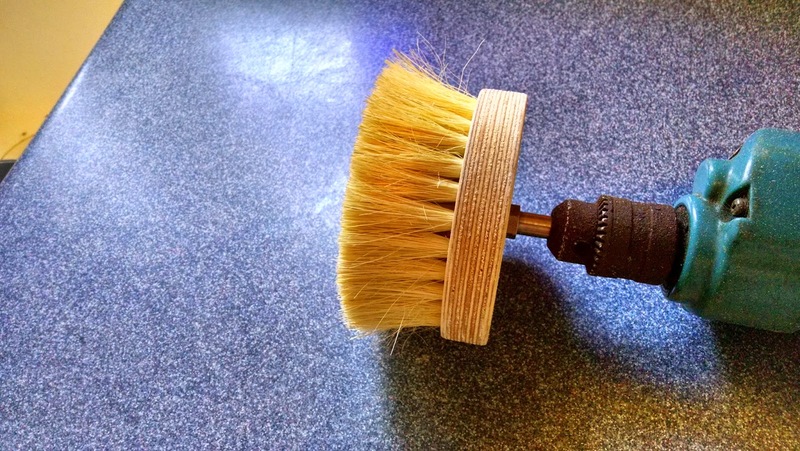 I purchased a brush I could attach to an electric drill to save myself a little effort on the polishing end. The surface was so nice to touch and the wax added a slight touch of orange over the paint, giving it the antique but clean look. 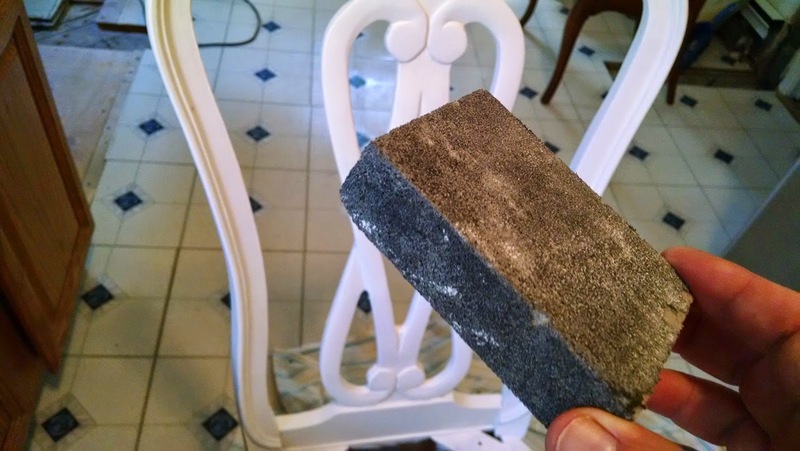 After the chair was finished, I tackled the seat. 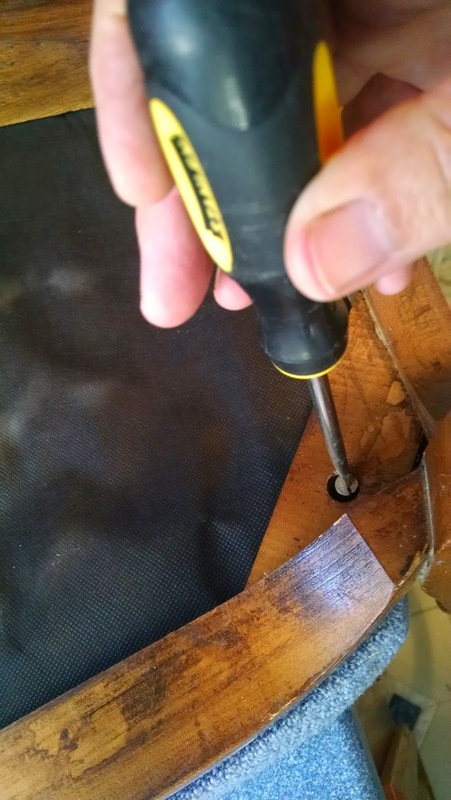 Originally, I thought I would reupholster the chairs but after looking at the quality of work, I decided to try cleaning them first, using the attachment on my carpet cleaning machine. 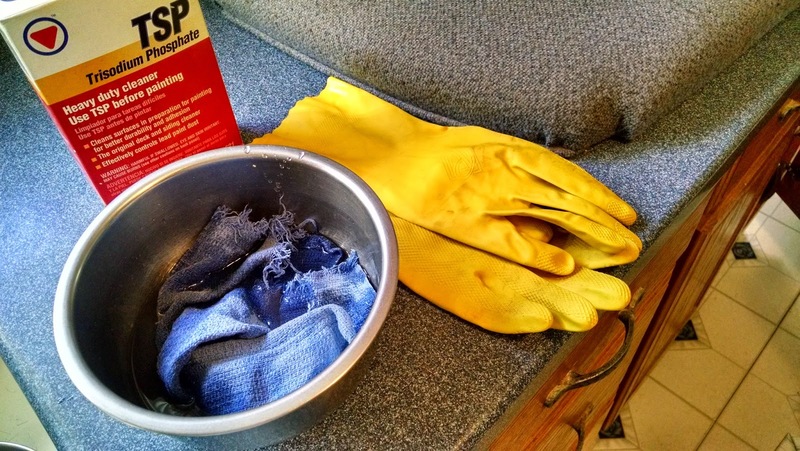 It worked after three or four passes and lots of scrubbing. A day for drying and they were ready to be screwed back together.